OUR.Host - Azerbaijan Hosting Provider is the brand of OUR Technology which presents hosting and related services and started its work in October 2015. Our goal is to provide qualitatively web hosting services, VPS / VDS and dedicated servers for the best price in Azerbaijan and Ukraine. By creating the brand OUR Host have achieved to be able to provide much more professional and high-quality hosting service. We set the specific goal - to do a thing, but to do it in the perfect way. Our equipment is located in the data centers in Azerbaijan, in the United States of America, in Lithuania and in the Russian Federation. We use RAID devices for our powerful server platforms while hosting services are provided. We are constantly control all of our services. We guarantee for 99.6% uptime hosting. We provide hosting resources for hosting your websites, projects and services on the Internet Network. Here you will get the best value for money. We have tried to minimize the cost of all our services, but have maintained a high level of quality and reliability. Professional approach is one of the most important aspects for us. Each request analyzes with a special attention and to solve the technical problems professional staff are involved. We guarantee for technical and related services. Our services are used by a wide variety of clients: web developers and design studios, beginning Internet entrepreneurs, game server owners and large companies. There is no requirement for placing internet projects, which we could not meet. We sincerely believe that you will be among our customers! We work to accompany our customers on the road to success. Our mission from the first day is high quality, reliable and safe service. We are interested in long-term relationships with our customers. Therefore, we try to demonstrate a special attitude to the projects of our clients. We believe that we are engaged in an area that serves progress. Therefore, drawing on the continuously growing own experience, every time we apply next generation technologies. 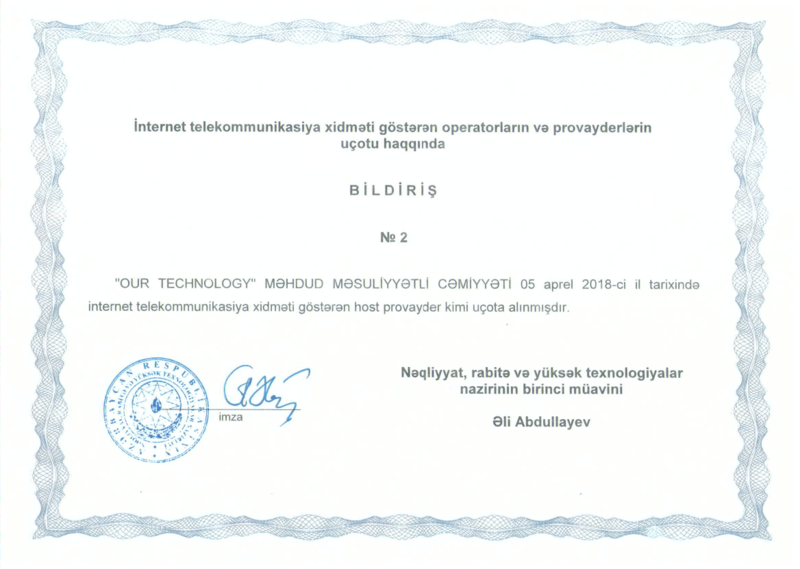 We are officially operating and having the relevant documents hosting provider of Azerbaijan. The office located in Baku and at the time of payment, the client (residents) is not charged VAT.